When in Turkey, I lose my cumbersome Scots Gaelic name in favor of something that is more verbally palatable to the locals. 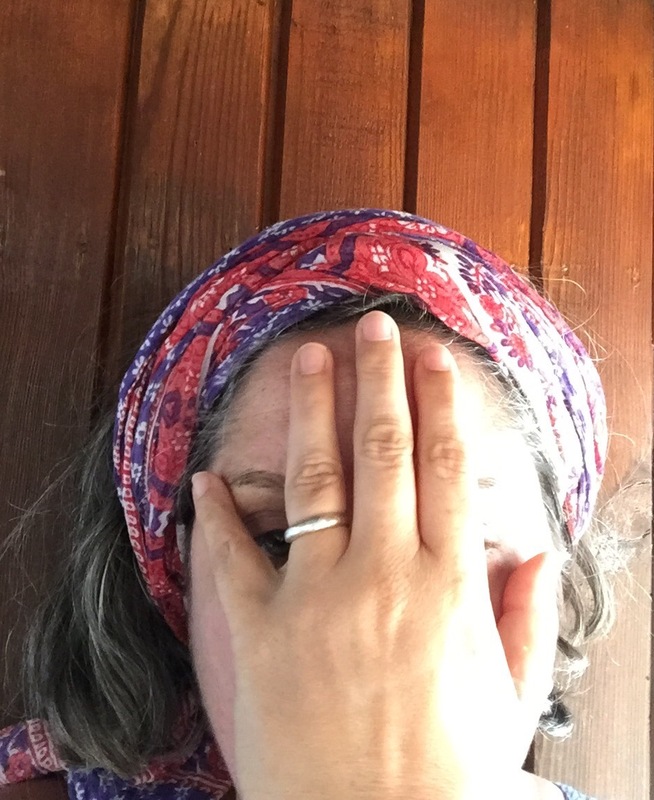 I become “Esma.” As regular readers of this blog may recall, Esma is also the hippie puppet that is a member of the Karagöz puppet troupe that inhabits my head in support of my cross-cultural relationship. You can read all about it on the “about” page, above. It’s 13 years in now, and I still need those puppets! Whether I am using “Esma” or my real name, perhaps the most difficult aspect of being female in Turkey for me as a yabancı (foreigner) is knowing how to recognize and handle gendered situations in which I feel invisible and/or visible. Well, what exactly do I mean by that? Let’s let Esma the hippie puppet explain. M’Lady feels very visible when in Turkey. Not only is she tall and pale, but no matter what tweaks she makes to her wardrobe, she doesn’t seem to fit in either in Istanbul (European side of the continent) or in rural Anatolia, (rural Turkey on the Asian continent) places where she and her husband spend good chunks of time. As soon as she is identified as an American, she represents what America is and is like to many she meets – and she doesn’t much like that visibility – she’d rather be invisible. Some comments she has received over the years include “she’s not like most Americans” and “she’s a bit heavy, like the Americans are because they eat two hamburgers a day.” Karagöz, the trickster puppet snuffs out a chortle on that one. So, she is an obvious yabancı, but she is also obviously trying very hard (maybe too hard?) to be respectful of a culture she doesn’t always agree with. In fact, it’s taken her years to write this blog post because she hasn’t wanted to write in a way that highlights the stereotype of a macho, patriarchal country and culture. What she’s begun to realize, though, is that while her own experience of life with a Turkish husband is not macho or patriarchal, this is the exception. It’s hard to face the truth. So, respecting a culture you don’t always agree with…How does this play out, you may ask. Well, let’s take the issue of walking down the street in Anatolia. For years, M’Lady was thrilled to be able to greet all those she saw on the street with the proper greeting for that time of day “iyi günler,” “iyi akşamlar,” or “iyi geceler.” She always felt a bit crestfallen when people – especially men – gave her the side eye and did not respond. It took many years for her to accept what her husband explained, that they were not responding out of respect for him. As in, “I won’t engage with your woman.” In essence, that’s your property. Now after really “getting” this, she takes to walking head down when she sees a traditional-looking man (yes, it’s an assumption) nearby, she’d rather avoid the whole situation. She wonders whether this is the right way to handle it, but when is one’s Liberty pushing one culture on another? When she walks head down, a sadness washes over her and she wonders what it would feel like to be an actual Turkish woman in Anatolia. Invisible? She cheers herself up by remembering that there is a spectrum of how this plays out. In central Anatolia, it is explicit invisible-ness whereas in the Western Aegean region there is much more flexibility and some openness. She thinks this is because Islam is more rooted in central Anatoloa whereas secularism (and with it more of a focus on women’s rights) has much more of a grip on the way culture plays out. Her husband is skilled at navigating the cultural divide in such situations – he eschews the archaic (in his mind) idea that she is his property but just allows the traditional interaction to play out, feeling perhaps that upsetting the apple cart with newfangled approaches to gender in the form of equity are just not going to fly in traditional situations far out in the countryside. And she’s getting better at it too, but still doesn’t like feeling invisible at times. While a bitter pill to swallow, the type of walking on the street interaction was not as hard as some other types of situations when she was visible, yet invisible at the same time – even in the western Aegean region. Take waiting in line at the airport scanner only to have the men behind her push ahead of her while their wives waited behind her. Or take the experience of standing in the fish market, where an active conversation is going on both between the fishmonger and the husband as well as the husband and the wife (in different languages). Here, the wife is clearly an active part of the transaction, but the fishmonger never looks at her or speaks to her or even acknowledges her presence in any way. It feels odd to her, uncomfortable. She wonders whether Turkish women ever come to the fish market- I mean, they must, right? What happens then? How do they buy fish? Maybe it’s just the fact that I’m a yabancı gelin (foreign bride) that makes this worse? Or is it that my Turkish skills are not up to snuff? Or all of it? And then there are the visits from her husband’s good friend on the western Aegean island. This year, when he greeted her warmly in Turkish, he both shook her hand and patted the top of her hand with his other hand. Progress! She thought. He even looked her in the eye. But other than that moment of visibility, she became mostly invisible again. Every afternoon, he stops by for tea, which she dutifully prepares in the double-boiling process. She prepares a tray with two glasses of tea, a bowl of sugar lumps and a plate of cookies (his favorite cookie has Nutella in it). She walks it out to the breezy spot where the friend and the husband sit, talking about life. She can usually tell what the topic of conversation is, but gets lost in the grammatical details. She places the tea in front of the friend, but he never acknowledges her or says thanks like her husband does (she wonders if her husband is modeling his ideal behavior for her friend?). She thinks this is because the friend expects she will do so, as the trees are expected to sway in the breeze, they just do. She is visible, yet invisible to this man. It’s just an odd place to be, especially as she know he has no ill will towards her. Perihan hanım, the fairy godmother puppet steps in now, saying, it’s a blessing and a curse to see across two cultures. Just consider it part of your special power to understand differences – and make it work for you are you are able. Always remember to take the anthropologist role when you feel most uncomfortable, as this will help you make it through uncomfortable situations. But when all is said and done, Perihan hanım continues, it is in your own marriage where you feel visible, and that’s the most important thing. It’s a good thing that your husband’s mother took special care in explicitly encouraging him to “not be macho,” for example. One day, when your husband was young and in love, he sought counsel from his mother, saying “she doesn’t understand that I love her.” The mother replied “well, most men wait for women to understand them – not the other way around. Maybe you need to try to understand her!” And this moment shifted his personal culture forever, which is perhaps one of the reasons he left Turkey, to be in a place where he fits in more. 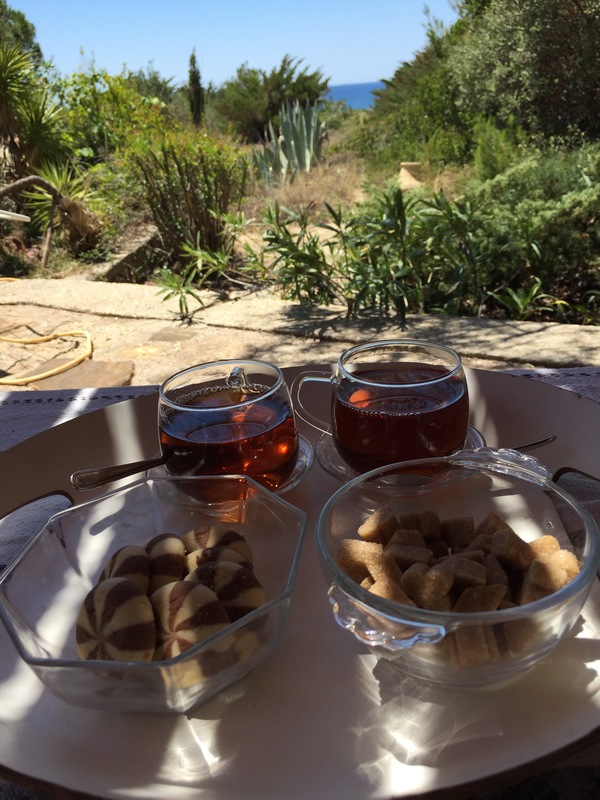 As I reach this positive note, the Karagöz puppets bid me adieu and I finish my glass of tea, wondering, how does this play out for other women in Turkey – or other places? So what about you, dear reader? There’s no answer here, just the capacity to notice. This entry was posted in Cross-cultural learning moments, Gendered moments, On Islam and Muslims, Visits from the Karagöz puppets and tagged Anatolia, çay, female, Gender, gender relations, tea, Turkey. Bookmark the permalink. Excellent post, Els, one of your best, in my opinion. It is nuanced and not angry about the nuances. It expressed a range of emotions, without either blaming or excusing – so we won’t blame – the culture (s) involved. It is elegant observation, human through and through. Thanks! Many thanks anonymous- though you know my childhood nickname! This is a moving post and poses a lot of interesting questions. Does one accept and submit to another culture, does one rebel and throw your beliefs in their face, does one work quietly to try to push them to change? There is no easy or correct answer as you point out. I deal with this often in Italy — people want to toss me into the “American” box which has meant over the past 20 years being blamed for the war in Iraq, the comments of Trump, bad food etc. I fight back openly on that one. There are other different issues that have irked me over the years, my husband is always greeted as “Professore” and I am simply “Signora” (when anyone with a University degree in Italy is a Dottore), people are interested in asking me about that “terrible” America in their minds, a place with gas-guzzling cars and hamburger-guzzling people, but not about me and my experiences as a professional journalist. Anyway, I like the image of you quietly preparing the tea and serving it — your mind full of thoughts, ideas, analysis of the situation. 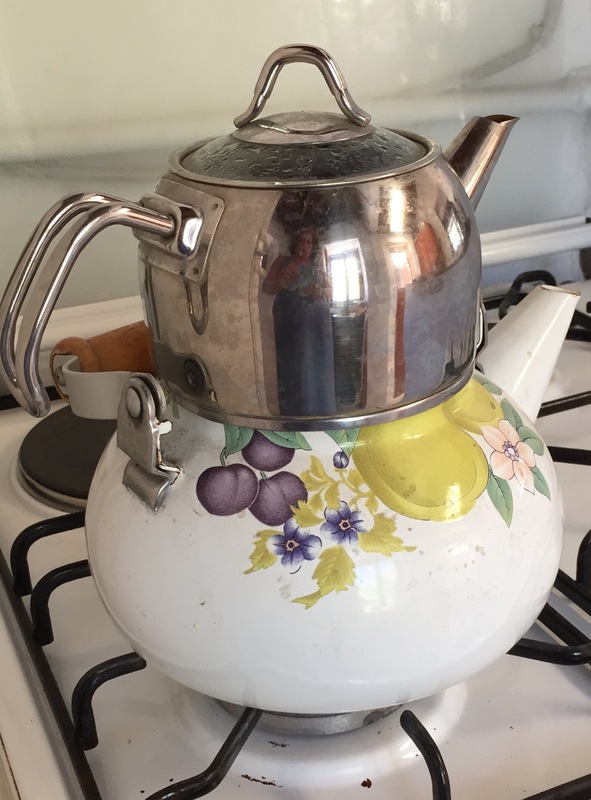 I also like the photo with the reflection of you in the tea kettle. It look so beautiful there. I wish I could sit with you under a tree with tea and cookies and have a nice chat. Thanks so much, Trisha, for your comment. Your experience truly mirrors mine more than I knew. I don’t know how you have been strong enough to stand that treatment for 20 plus years – well I do know, you just have to. Here, even though I am the “dottore” and M is not, he gets all the interest because of the Harvard connection. Infuriating. In any case, I really appreciate your solidarity! Love you. Your post is so relatable. Even though I live outside of Izmir, (more liberal and open than many parts of Turkey) I experience the same things you describe. My very modern, Americanized Turkish husband has cautioned me not to speak to the many workmen who have been building our home here for the last year. He says my talking to them will make them uncomfortable and embarassed. He explains they will misunderstand my friendliness. So I don’t speak to them, nor they to me. Nor do I wave to the old men walking up our street as I drive down – something I would do in the US without thought. While I understand the reasons behind why my husband advised me to do so, I also feel so conflicted about feeling invisible. Thank you for writing about this in such a sensitive way.